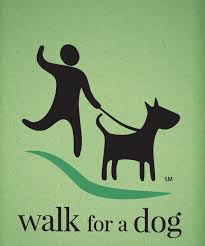 October 1st through October 7th is National Walk Your Dog Week. How great is that? 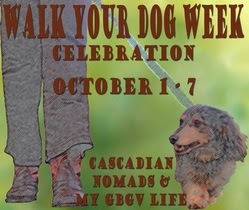 I want to participate, so I'm joining the Walk Your Dog Week Celebration Hop. And I'm committing to walk Jedi at least 15 minutes every day this week -- no excuses. Truth is, regular walking is harder for some of us than it is for others. I can spend 30 minutes talking myself out of a 15 minute walk. I know it's good for my health and it good for Jedi. It's still difficult after a long day at work but I think I found something to make it easier. I discovered WoofTrax, a free app for your smartphone (both Android and iPhone). With this app a small donation is made to the animal shelter or rescue of your choice every time you walk your dog. If you look to the right of this post you'll see a widget for it just above "Contact Me." Click on the icon it'll take you straight to the webpage. So how does it work? After you download the app you set up a profile -- complete with an adorable picture of your pooch -- and select the shelter or rescue you're walking for. I chose Jacksonville Animal Care and Protective Services. Once your profile is created, all you have to do is get up and walk. WoofTrax works with the GPS in your phone to keep track of your mileage. About 3 times a year WoofTrax sends a check to your shelter/rescue based on the distance of all registered walkers who chose that shelter. (According to the site, donations range between 11 and 25 cents per mile.) As of today there are 23 people walking for JACPS and we have walked 134 miles. P.S. This is a hop. Click around and see what great tips others are sharing this week.